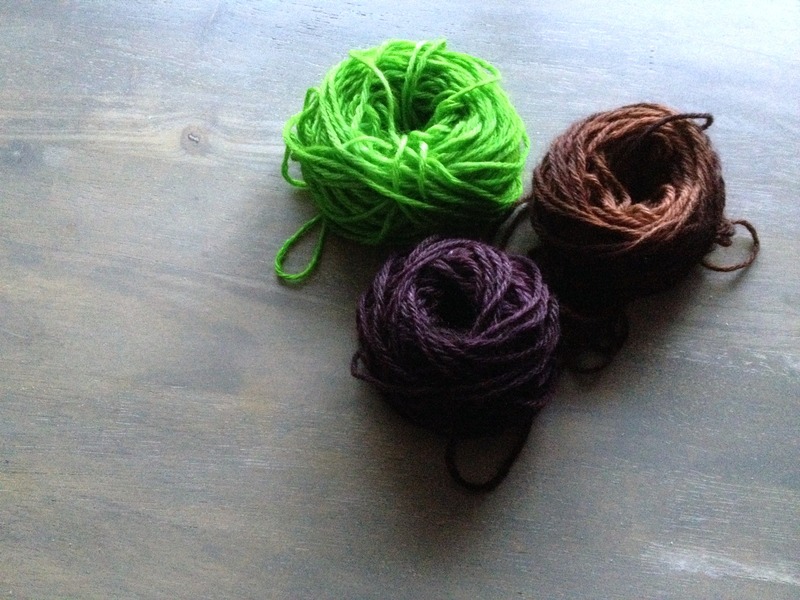 Last week, my friend Stacie came over and helped me dye some yarn. Originally, she was going to help me paint the frames for the living room, but I jumped the gun and finished before she got here. While cleaning up, I found some of the Kool-Aid packets I had purchased a couple months back for my Kool-Aid Cowl. She’s an artist and loves colour. It seemed like the perfect match! The first one she wanted to be ultra green, very vibrant. We mixed two packets of lemon-lime with two packets of lemon. The result was a gorgeous Easter grass colour. I think it turned out absolutely wonderful! The second one was two packets of grape. Here’s where things turned relatively unexpected. I wrote in an earlier post that the colour turned out almost eggplant. I think I take that back. It’s much much darker than that. In fact, it’s nearly black. So, purple-black, I guess? Either way, I really love it. The third one, I had a lot of fun using up the last of my Kool-Aids. I used grape, orange, and lemon. Stacie was more than correct that the resulting colour would be brown. It is brown. There’s more to it than that, though. The outside of the ball is much darker and has a hint of the grape. It gets much lighter by the time you reach the centre. I’m not entirely sure what to do with these yet. They’re small enough that, unless used in a colorwork piece, I’m not going to be able to make a whole project out of them unless it’s quite small. I did think about using them to knit up swatches to frame for the wall. The green would work very well, but the brown and purple might be too dark for the stitches to really show up. Also that evening, I made S’Mores Brownies for my husband to take to work for a baking competition. Instead of marshmallows, I whipped up some homemade marshmallow frosting to put on top. We toasted the edges and made it look so pretty! I kind of wish I had taken a picture. They won at the competition, I found out the next day. They were too delicious! I recommend trying the recipe, but I also caution you. This is not diet-friendly food.